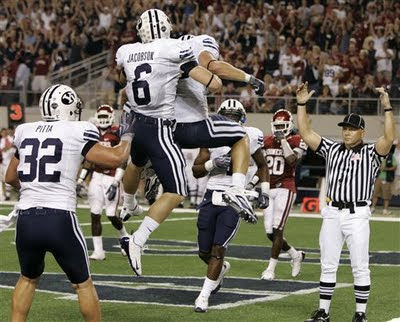 14-13, BYU over #3 Oklahoma. We crashed at another BYU alumn's home with 5 boys of their own and together 12 males (from 2 families) and 4 females enjoyed a GREAT beginning to a BYU football season! And probably way too many hotdogs, hamburgers, and hand fulls of carmel corn!